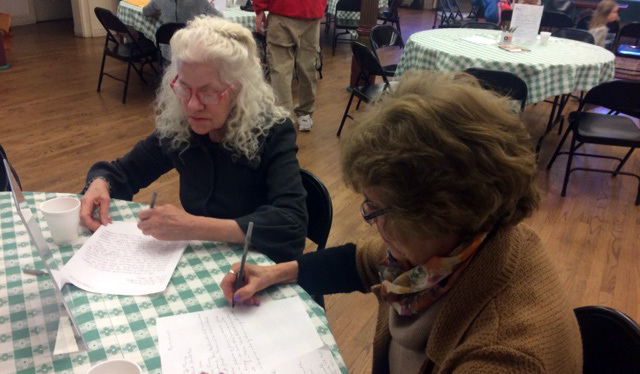 Old St. Joseph’s parishioners Tish Byrne and Marian McDonnell participate in a letter writing campaign March 24 at the church in Philadelphia, sponsored by Catholic Relief Services, to encourage Pennsylvania’s two U.S. senators to support international food relief programs. Old St. Joseph’s, Philadelphia’s oldest Catholic parish, has seen its surrounding area of Old City transformed in the second half of the 20th century from industrial and working class to one of the most gentrified residential neighborhoods of the city. But it has never forgotten its roots and its commitment to the poor — not just locally but internationally. On Sunday, March 24 during their two scheduled coffee hours in Barbelin Hall, the parish encouraged those attending to write letters to either or both U.S. Senators Robert Casey and Pat Toomey. The letter writing campaign complements the annual CRS Rice Bowl Program sponsored by Catholic Relief Services. The purpose of the letters is to advocate for federal funding for international food relief programs. Food relief is at the heart of what Catholic Relief Services is all about. In addition to utilizing the coffee hours as an opportunity for letter writing, it will also be done at several other parish functions over the Lenten season. The letters will later be hand delivered to the senators. 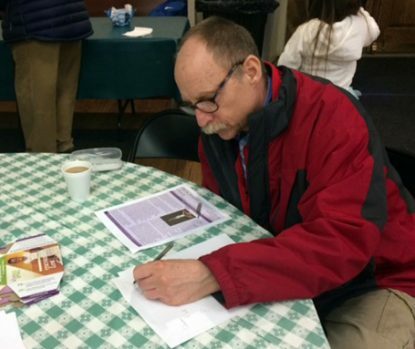 Paul Lauck writes a letter during a coffee hour at Old St. Joseph Parish’s Barbelin Hall on Sunday, March 24 in support of a Catholic Relief Services campaign to urge more federal funding for international food relief programs. Jeff Wallace, a regional representative for CRS who recently became a member of Old St. Joseph’s, believes the parish participation really stems from the charism of the Jesuit order of priests who serve there. Other programs planned at the parish include involvement of students and also a simple meatless meal based on a recipe offered by CRS Rice Bowl, according to Wallace. Old St. Joseph’s is just one of a number of parishes in the archdiocese that are actively supporting CRS initiatives including approximately 15 parishes in its Ambassador Program. Under that program parish representatives educate and mobilized their parish community when a global emergency occurs, and they provide leadership for Rice Bowl and other CRS initiatives. To learn more about CRS visit their website here. 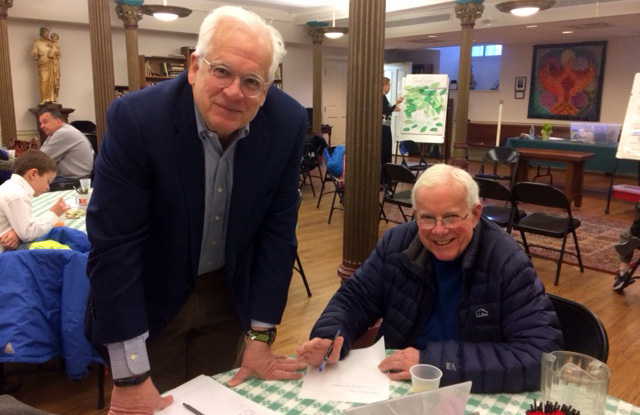 David Robb and Ted Robb gladly spend time at a parish coffee hour March 24 at Old St. Joseph’s, Philadelphia, to write to U.S. Sens. Bob Casey and Pat Toomey in support of federal funding for food aid.